omid (mashhad, Iran) on 14 August 2012 in Cityscape & Urban and Portfolio. Superb composition ! Beautiful ! Perfect picture for B&W. Lovely. A very interesting series of photos in silhouette. Great shot. Splendid light and silhouettes. An excellent picture! I love the placement of the far off crane inside the closer sillhouette! This image makes it feel still and calm, nicely done! Wonderful image! The sun goes down over the crane! Perfect silhouettes, so deep and black! Tes cadrages sont vraiment excellents, splendide contre jour. Bonne journée. quel découpage des éléments en noir quelle lumière en fond sueprbe. salam khili doost daram karhaie behtari as to bebinam...aghar che zede noor khobi sabt shodeh. I like this gigantic lamppost and the warm tones of your image! Paysages urbains très beau malgré l'image mécanique. Perfectly captured omid, fantastic color and clarity!! Wonderful capture ... very crisp silhouettes, beautiful light and tone! Very interesting composition with nice tones and great silhouettes !!! The lighting and shadows make the shapes so nice. A nice strong use of silhouettes with a unique sky tone. I like it. Nice composition ! Beautiful shot ! Have a nice day omid. 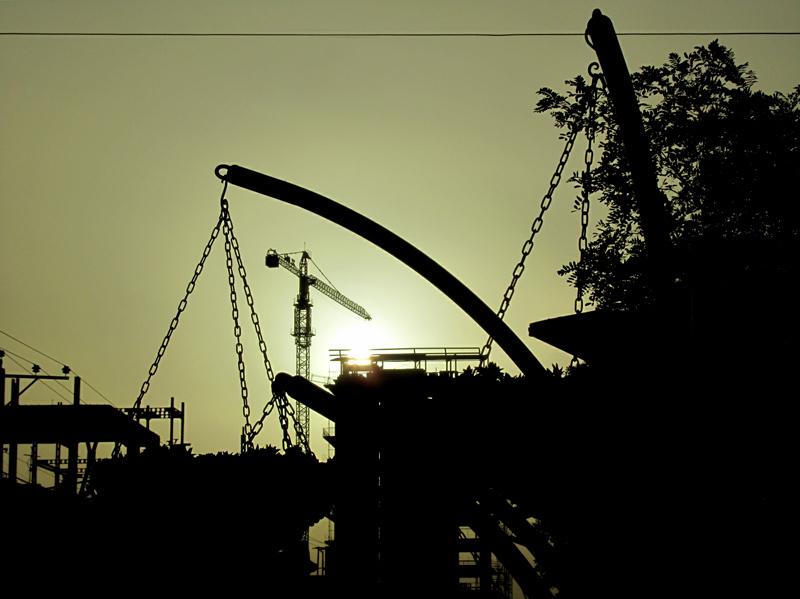 good capture of this crane loading / unloading with a background of sun evening they doing magic now. Good contrast of light. A warm greeting. Excellent combination of elements in this strong back-lit image. Very good work. طالب ِ انتقادات ِ صریح شدید! توانایی بی نظیری در استفاده از خطوط دارید. Interpelle le regard, splendid light !!!!! The entire series is terrific, omid, but the quality of light on this one is just gorgeous! I love it.